First Person Magazine #4 launch – Saturday 7/17. This issue features Yoko Ono+Ryan McGinley. And it’s to be letterpressed at the workshop in the days before. Rad. 3″ Type with Craig Newmark – Tuesday 7/20 noon-4. So as this is midday on a weekday I won’t personally get to witness the awesomeness of Newmark (founder of Craigslist and really smart guy) directing the assembled students to print slogans about internet civil liberties in big wood type on posters. For those of us who can’t make it to the daytime class, that Saturday Newmark and The Post Family (who you may remember from Typeface) are having a free content party. 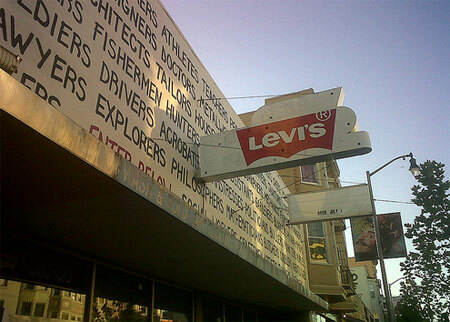 Levi’s Workshop Night at the Giants Game – Tuesday night 7/27. I also won’t be attending this night but it sounds pretty rad. The workshop will be at the game (I bet the vandercook is staying home) screening a short film at halftime and passing out special edition Studio Number One (yep, that’s Shep Fairey’s studio) designed SF Giants trading cards. If someone wouldn’t mind picking me up a pack I’d be really grateful. Stefan Sagmeister talk – Friday 7/30. Sagmeister is probably my favorite living designer: his work is consistently thoughtful and innovative. I’m really psyched at this chance to see him talk. This event and many others mentioned on the letterpressed full schedule are mysteriously not on the website calendar, but it’s at the link above. Farming 2050 Calendar/Broadsheet collection release - Friday 8/20. Edible Schoolyard food-education pioneer Alice Waters and futurefarmers agricultural-artist pioneer Amy Franceschini are releasing a set of broadsheets and calendars they produce at the workshop. It may be all the progressive-positivity talking, but I feel like this is a the hopeful future of food right here. I’m a San Francisco-based printer and was contacted by the media/marketing team behind the Levi’s “print shop” about doing some of their workshops. Initially, I was stoked to be considered for a project like this–I love the idea of putting letterpress in the hands of the public (instead of reserving it for those who can afford fancy, photopolymer wedding invitations). However: They were looking for folks who could work full-time for several weeks, but were only paying $13.50 an hour. That’s barely a livable wage for us living in one of the most expensive cities in the country (world?). I work full-time, and wouldn’t be able to afford to take several weeks off at that level of compensation. Bummer. It would be great to actually feel like I could make a living doing the art that I love, even for only two months. I haven’t been to the space yet. I don’t want to trash talk it. I can’t help but feel, though, that if a corporate sponsor like Levi’s genuinely wants to recognize the value of a unique art form–and support the artists and the community behind it–they’ve got to step up and put their money where their mouth is. Otherwise, it’s just another flimsy marketing stint from another large corporate brand. Okay. That’s the end of my rant. Surfing around earlier, I saw your comment posted verbatim on the Mission Mission blog too. I think you should just drop by and check it out for yourself. I was skeptical myself, but I feel differently now, having been there. Maybe the people who took the job figured (if the pay you quote is true) that $13.50 being printmakers is better than $9.00 (or less) making coffee somewhere, or $4 plus tips waiting tables, or even worse, how about $0.00 looking for work? Having actually been to the shop myself, I think I am qualified to say that they HAVE put their money where their mouth is. Those presses had to cost something, plus paper & ink, plus what looks like at least a half dozen people with jobs, plus the people who had to rebuild that old place, (painters, electricians, glass people, drywallers, etc.) and then the part about how they give all of those materials away for free? Paper & Ink ain’t cheap. I also read that they are donating ALL of the money they make selling stuff to non-profits in the neighborhood – If that’s true, it doesn’t sound like a “flimsy marketing stint” to me at all, in fact it sounds BRILLIANT. As an aside, I also Googled around to see where SF ranked as one of the most expensive cities in the world. Wikipedia ranks SF as number 36, so on that point, you may actually be right.